In the old paradigm the stock market was both a reflection of economic reality and a window on the future. It used to be Wall Street was intimately connected to what was happening on main street in a myriad of ways. That was of course the old paradigm, not the one in operation today. The stock market is now merely a reflection of how much money the Federal Reserve is willing to send its way. This new world is one where Washington and Wall Street are insulated from economic reality, where suffering goes unnoticed and creeping economic cancers are ignored. Welcome to the world of Obamanomics. In one week the people of the United States saw the Dow and the S&P 500 hit new highs as well as found out U.S. poverty is at its highest since President Johnson declared war on it some fifty years ago. Additionally 623,000 people gave up looking for work and the U.S. economy again could not even scrounge up enough jobs to keep up with population growth. The bad news reverberated through the markets for all of a day. As a MSNBC host reflected, this seems to be the new normal. The great U.S. economy, engine of the world, is quickly becoming an also ran among a world of mediocrity. The media was quick to blame the Sequester (economically a non-event) and the tax increases and just as quickly rush to something else. Of course why not? There is nothing news worthy about a spitting and sputtering U.S. economy, at least not since the Democrats took over the White House. 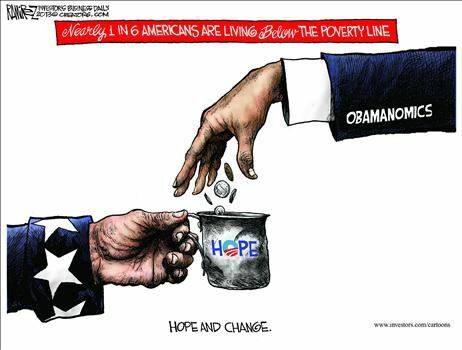 The climbing poverty rates and minority unemployment would have been on the front pages of the aging liberal press on a daily basis if Bush was still in charge but the number of people increasingly on government assistance is a non-event with Obama at the helm. Just as alarming, the government’s present policies are managing to do what for years the Democrats have been falsely claiming was happening, namely shrink the middle class. With all of this the American people still do not seem to blame Obama. The economic disconnect between Wall Street and main street is easily understood when the actions of the Federal Reserve are taken into account. Good times are being had by all in the American stock exchanges as long as they are reaping the rewards of central bank money. Nor can one totally blame Ben Bernanke, he is trying to use a balloon of Fed cash to keep the economy from crashing to the ground, something that is unfortunately part of his mandate to do. A disappointing set of circumstances but understandable. The economic disconnect of the American people is the real mystery. Their continual suffering under Obama’s economic policies and their support for him seem out of touch with reality. While it is true the media has covered for the President, the consumer confidence levels and the pessimism for the future seen in poll after poll show they have not been all that successful. The people know the country is in trouble and even despise and blame many of the policies that have gotten it that way. Despite this they like Obama overall. Even though his approval ratings dip from time to time into below the fifty percent mark he still commands enough support to likely win an election. In fact his support is highest among those whom his policies have hurt the most, minorities and the young. Given, he is a seemingly cool black guy who has experimented with drugs, but just how big of an economic baseball bat does one have to be hit with before common sense starts to seep in? Unfortunately the man with no plan is going to be in charge for awhile. This means the slow chugging of the American economy is unlikely to improve anytime soon. Given its fragility, a significant downturn is not out of the realm of possibilities. The best one can hope for is continuing Washington gridlock so further damage can be averted. One thing is for certain, no longer can people look to presidential approval ratings or the state of the stock market as good barometers of how the economy is doing. Those days are gone, at least for now.